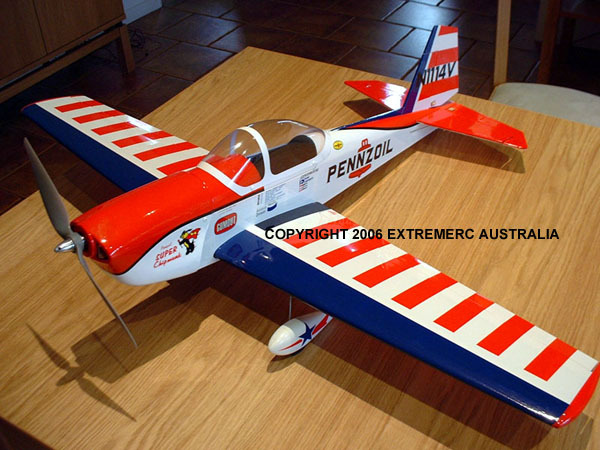 EXTREME RC AIRCRAFT GALLERY : RC Hobbies at Extreme RC Electric flight Specialist, best range of ducted fan EDF jets in Australia! It may not be published nor reproduced in any other form. The Super Chipmunk is an awesome model, flight characteristics are superb, she handles like a big trainer yet is capable of a wide range of aerobatics. Powered by a Z4025 outrunner through a LIGHTNINIG 80A ESC on 6 cell 4-5000mah packs, the Chipmunk runs at 1650 watts and produces 4.2kg static thrust and just over 80mph on an APC1410E. We use a LIGHTNING 5A HV-UBEC to power the radio gear and servos are standard JR539 digital as found in most radio sets, yup finally somewhere to put those huge servos you have sitting in the box! I will be swapping out the wing servos for some Waypoint 1706MG soon as I get some time, they are lighter, heaps faster and have metal gears. 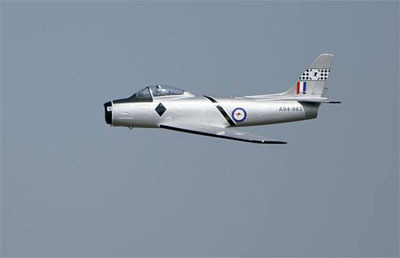 With a 1.6 metre wingspan the chipmunk has a real presence in the air and the Pennzoil colour scheme is easily seen. Fantastic model! Latest and greatest, the Mirage has been built in Australian colours and is a two seater RDU version, number A3-113. Runs Wemotec Midifan upgrade with the new ARC3675 inrunner and two ELITE 4000mah 4s1p 25c packs in series. With 2700 watts on tap the Mirage has been clocked at 150mph! The airframe has been sanded back lightly and glassed with 3/4oz (25 gram) glass cloth and Polyurethane with Q-cell micro-spheres mixed in to fill and strengthen the weave. Best finish I have done so far with the glass! The F9F is a brand new model from LANDER. This Panther would have to be one of the best jets out of the box we have had! A new fan unit CNC machined from aluminum featuring a 5 blade rotor and alloy spinner, powered by a 2847 inrunner that puts out 900 watts on our ELITE 4000 4s1p 25c packs and pushes the Panther along at 105mph level flight! No need for upgrades here, build it in an evening! Hand launch is a breeze! This is our Black Diamonds version of the FlyFly SABRE, a 1.4 metre wingspan 90mm ducted fan jet, brings a new level to affordable EDF models! Superb flyer, smooth and graceful in the air, scale speed of around 90mph on our 6 cell setups. Our Sabre runs factory retracts with custom made main legs, 2.5” scale rubber wheels with alloy hubs, airframe is completely glassed with 3/4oz fiberglass cloth and polyurethane. AUW is 2.8kg with our EXP4100 6s1p battery pack. Awesome aircraft! One of the nicest small jets to fly, you can go from mild to wild with our F16! My personal F16 runs a Wemotec Minifan PRO with a series II HET 2W18 Typhoon motor. Minimal modification is needed to fit the fan, it almost drops in place. Running through a LIGHTNING 60A ESC with switchmode BEC and ELITE 2500mah 4s1p packs, has been clocked at 135mph level flight, that’s almost 220kmh. Power system runs around 800 watts, there is another 100 watts there if a bigger battery is run but the model is the ideal weight with 2500mah packs. A very agile and quick little plane, little being the operative word! Easy hand launch and very responsive, this aircraft flies on rails. We have two packages for this, a 3 cell setup that draws only 15-16 amps, uses an EXP1300 3s1p 20c pack and provides almost 1:1 thrust to weight ratio. The popular 4 cell setup draws only 19 amps, uses our EXP1300 4s1p 25c or PQ1200XQ 4s1p 30c packs and pushes the Tigershark to 100mph level flight! AUW around 530 grams and thrust around 650! The Ultimate 40s is a mid sized biplane made for a 52 four stroke. Mine is built as electric and runs an EMAX 4020-08 out runner, LIGHTNING 60A ESC with built in switchmode BEC, Polyquest 3200XQ 5s1p 30c/50c lipo, PARK HPX/BB servos on rudder & elevator and a waypoint 1706MG for the ailerons. AUW is 2300 grams and the power system runs at 830 watts on an APC1470E prop! Climb rate is excellent, plenty of power, system runs at 44 amps static and a 5 min mixed flight uses 2000mah. Impressive electric aircraft! GWS have really gone all out this time! This jet is huge, lots of detail, classy looks and superb flight characteristics. Runs EDf64 fans with 2040 3900 inrunners on 2200mah 4s1p 25c batteries. Pretty much the same power system as the ME262. Slow fly-bys wow the crowd and the rolls and turns are very scale looking. A great looking and flying jet! My GWS ME262 features 2040 size in-runner motors with half a Hyperion heatsink on each can. Running twin DN LV25A esc’s and PQ2000XQ 4s1p 30c batteries, the planes AUW is 935 grams and thrust is sustained at 1200 grams with a peak of 1.3kg on a fresh battery! Clocked at 95mph level flight!! Finish is that of the famous commander Major Walter Nowotny, one of the first commanders to receive a squadron of Schwalbes (swallows). Videos are linked to the EDF pages on the website, suffice to say the aircraft is very fast with excellent vertical performance. BAE RED ARROWS HAWK! Sporting a 64mm 6 blade ducted fan and 2040 size brushless motor as standard, this plane sets the benchmark for affordable beginner’s jets! 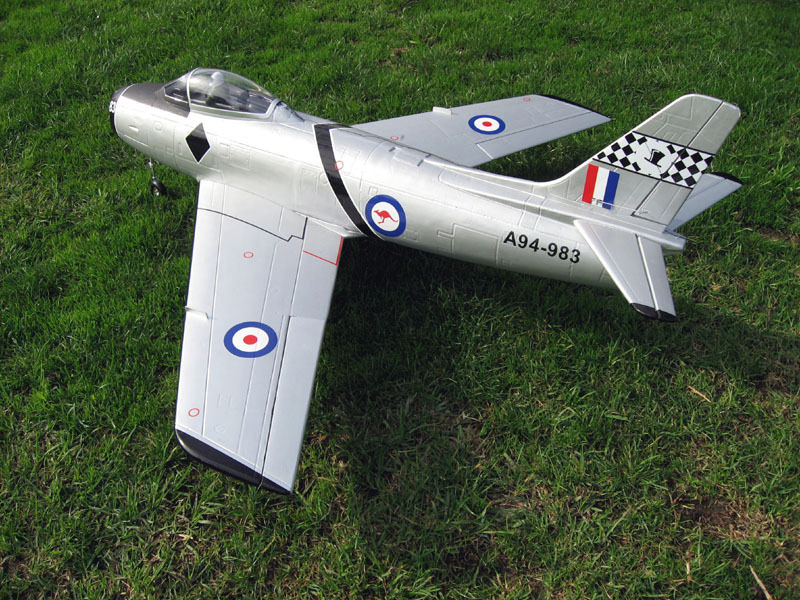 Extremely easy to fly, very stable, and slows down extremely well, a true parkflyer jet with the looks and the sound to match! Running on our 4 cell power system the Hawk performs very well, the undercarriage works perfectly for hard surfaces. If you are flying on grass just remove the undercarriage and hand launch. One of the easiest planes to throw, it also picks up a good turn of speed with no wheels! “ULTIMATE” A10 build features Hyperion Y22S motors spinning EDF55 fans, dual EXTREME POWER 30A esc’s and either 3s2150 or 3s2200mah 20c battery packs. Fibre Glass covered airframe with Carbon Fibre reinforcement, the AUW has been kept to 675 grams with a 175 gram battery pack, no mean feat!! ROG’s with no wheels, see the video link on the EDF page, plenty of power! ALFA Models Huckebein is a rendition of the second generation German jet fighter, a very unique looking plane that was often referred to as the flea. The 3 cell setup runs Hyperion Y22S brushless motor with stock Alfa fan, 30A ESC and various battery packs. It will produce 1:1 thrust with a 3s1300 20c pack and 5-8 min flight times. Best option is 3s1300 – 3s1700 20c pack. ROG’s with little effort, just be careful on climb out, it wants to pull up and stall until the airspeed is up a little. First flight required no aileron trim at all and only 2 clicks of elevator! Insane version runs a custom wound outrunner on 4 cells with 4s1700 20c pack, 30A esc in the exhaust and an external UBEC. Running at 400 watts and soon to be fitted to an Alfa MIG15! The EGO SU27 Flanker is a great looking aircraft; the swooping nose section rises back over the cockpit area before melding into the huge air intakes for the dual EDF64mm fans! Our brushless 3 cell high performance version of this model gives the jet a scale like performance, effortless large loops and vertical climb outs that take some time to drop off in speed! For Extreme Power go with the 4 cell setup that has the SU27 doing the cobra and then climbing out vertically! The Hyperion Chipmunk is a lovely kit, the finish is exemplary like all Hyperion models and it looks like the real thing! Soon to be refitted with our new EMAX 2215 outunner, on a 9045 prop and 1700-1800 20c battery thrust has been tested at 1.15kg!! The performance should be very good don’t you think? J high thrust and around 75kmh airspeed should make for a nice aerobatic scale looking aircraft! Flight reports coming soon! My BF109E! I built this plane a long time ago from a Japanese kit, it was originally designed for 0.35ci glow power, but I have decided to convert it to electric when time permits. It is a 48” span all built up and sheet covered balsa model. Power system will be an ERC3520 outrunner running on 5s with an 11-12 inch prop, should be able to get 1000-1200w setup into her! I plan to retrofit some Hyperion retracts into it to finish it off, should look rather good in the air!